The entire Michael Hingson Group, Inc. team will be in Portland, Oregon beginning this coming Thursday to participate in the West Region meeting of NACA, the National Association of Campus Activities. We look forward to meeting with representatives from nearly 600 colleges and universities from around the Western part of the United States. Since 9-11, 2001 I have spoken to many colleges and universities from around the nation, but never have I had an opportunity to meet with people from so many schools at once. We are going with plenty of literature and dvds for the students who will be roaming the exhibit halls to find speakers and entertainers for events at their campuses. My guide dog, Africa, Tony, Celia, and Gwen will be there to help me inspire the conference attendees and to show them how I can come to their campuses to speak about Teamwork and Trust, Handling Change, Inclusion, and even How to Study Physics in a Power Failure, (blind people do have advantages). We’re ready to talk, wheel and deal, and book events. From the several demo CAMPS to the various Block Booking sessions we will be ready and excited to find ways to work with the college reps in attendance. 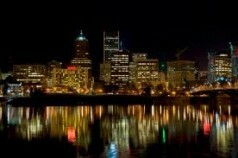 We will be in Booth 523 at the conference site in the Oregon Convention Center, 777 NE MLK Jr. Blvd, Portland, OR 97232. I am sure we will leave the conference tired, but motivated and excited by the new friends we make and by some good old college enthusiasm. Drop by and see us in Booth 523 if you are coming to the conference. This entry was posted in Uncategorized by Mike Hingson. Bookmark the permalink.